Sea Fever is a nearly new Arcona 400 from Sweden. Superb sailing performance from her powerful rig and excellent build quality will ensure that she is popular with the charterer who is seeking both excitement and something a little upmarket. On deck Sea Fever has an electric anchor windlass and a very large cockpit. 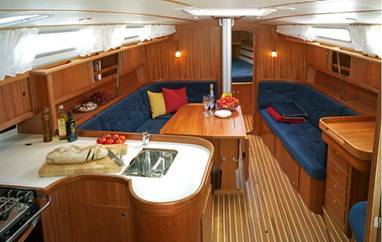 The cockpit table ensures that charterers can relax in comfort once the days sailing has finished. Very light steering is via a large diameter wheel (chart plotter on binnacle), whilst under power she is pushed along by a Yanmar 40hp engine connected to a folding propeller. Sea Fever has the popular three cabin layout with a good sized heads and shower and a ‘proper’ chart table. The galley and chart table lie either side of the saloon and are both of a good size, particularly the galley. The Arcona has a high aspect rig which derives most of its power from the fully battened mainsail (all lines led aft to cockpit). The furling 100% jib is also battened and, if required, she can come with a spinnaker for those who need even more performance (additional premium applies).